There was no Internet in the 1980s outside the laboratory, but many of the ideas and processes being used in Internet learning and assessment today were performed on other kinds of computers in the 1980s. 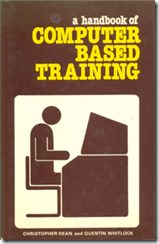 This useful book “A handbook of Computer Based Training” describes the state of the art in Computer Based Training in the early 1980s. It was written by Christopher Dean and Quentin Whitlock and published in the UK by Kogan Page and in the US by Nichols Publishing Company. This brief description will hopefully give you enough information to see if it’s worth tracking down a copy to verify prior art. There are several editions of the book – it was updated into the 1990s, the description below is from the 1984 version (re-printed with some revisions from the 1983 edition). Google books have a searchable copy of the 1983 original edition here. Much of the book describes technology which has been superseded, but there are two parts which might be interesting from a prior art perspective. Chapters 1 through 4 of the book are on the design of learning sequences. It describes how one identifies training needs and analyses and breaks down tasks and then develops training objectives – with a common technique being to set up a module with an objective and a post-test. Modules are then combined in a learning plan, which can be individualized or adapted for different learners. There is discussion of pre-tests and entry requirements for a course, and giving people remedial or equalizing training and modular scheduling and branching – with learning adapting to the performance of individual learners. You can search through the book on Google here. The US Government ERIC (Education Resources Information Center) at http://www.eric.ed.gov/ has over a million education documents going back to 1966. There is a huge amount of relevant prior art here – if you can find it! 1953 Proceedings of the Invitational Conference on Testing Problems in New York in 1953. Includes several papers describing test scoring machines which had been in active use for more than a decade at the time. 1970 Detailed description of an early computer-based Instructional Management System (Conwell approach) including tests – with a sophisticated approach to objectives, learner characteristics, learning styles and categorization of learning. 1971 Review of automated testing at the time by the Office of Naval Research. Considers test anxiety, validity and reliability, natural language processing, automated interpretation and more. 1974 Description of a computer-assisted diagnostic assessment given to medical students at the University of Illinois. It was created in a program called Coursewriter and allowed students to answer questions, skip and come back to review them later and give feedback printout 30 minutes after the test. 1977 200 page survey of US military computer-based training systems in 1977. Lists about 60 authoring tools/procedures, includes mention of PLATO, TICCIT, some coverage of computer assessment. 1981 Description of testing at BYU where computerization helped them deliver 300,000 tests per year. 1984 Detailed description of software for computer adaptive testing for the US Armed Services Vocational Aptitude Battery tests. Technical description and user manual. Features include automatic calling of proctor if too many keying errors made, ensuring that similar questions to previous ones not selected at random and holding demographic data within the system. 1985 Reviews of 18 sets of microcomputer item banking software: AIMS (Academic Instructional Measurement System); CREATE-A-TEST; Exam Builder; Exams and Examiner; MicroCAT; Multiple Choice Files; P.D.Q. Builder; Quiz Rite; Teacher Create Series (5 programs); TAP (Testing Authoring Program); TestBank Test Rite; Testmaster; Testmaster Series; Tests, Caicreate, Caitake; Tests Made Easy; TestWorks; and the Sage. Several programs used item banking by topic, random selection and password control. 1985 Report from the University of Pittsburgh about the state of the art in computer-assisted test construction – using computers to generate items or select items to form a test – includes a lot about levels of difficulty, use of IRT, test blueprints. 1985 Description of using the MicroCAT computerized testing system within the US Navy. Explains features of the software including a central proctor station which controls testing. It’s great to see the huge variety and innovation in computer testing from decades ago. The 1953 material is unlikely to be useful prior art today but some of the 1970s or 1980s material could be.